Wilde’s dissection of the mores and morals of upper class society includes aspects of “one percent” privilege, sexual politics and insider trading that make the 123 year-old play astonishingly relevant. 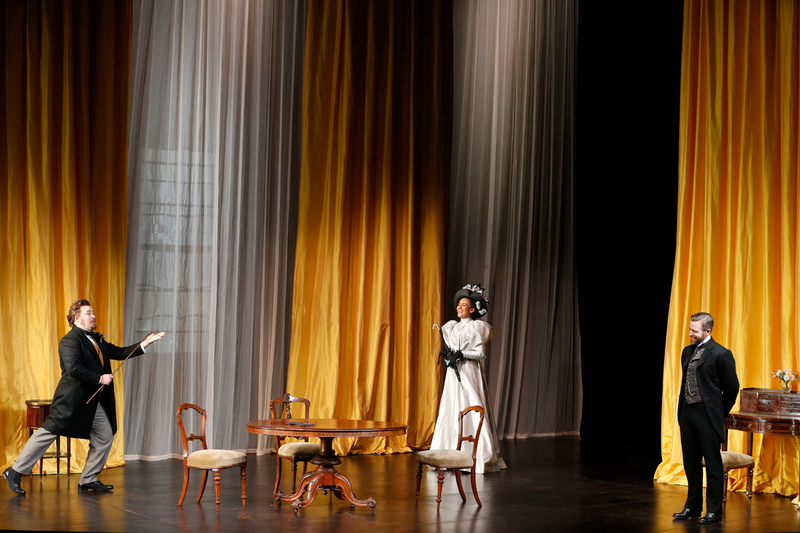 An ideal husband, Sir Robert Chilton (Simon Gleeson) is blackmailed over the dishonest origin of his fortune. Bearing out the theme of the need to forgive great men their past indiscretions, Lady Chiltern (Zindzi Okenyo) must learn to pardon Sir Robert and continue her support of his political career. The dramatic tension of the cleverly constructed plot is continuously relieved through the most delectable humour, delivered, here, with exquisite flair. The underlying appeal of Wilde’s wicked humour is the underlying truth in his astute observations; that this truth remains ever valid today speaks both to the depth of Wilde’s insight and the resolute nature of human interaction. 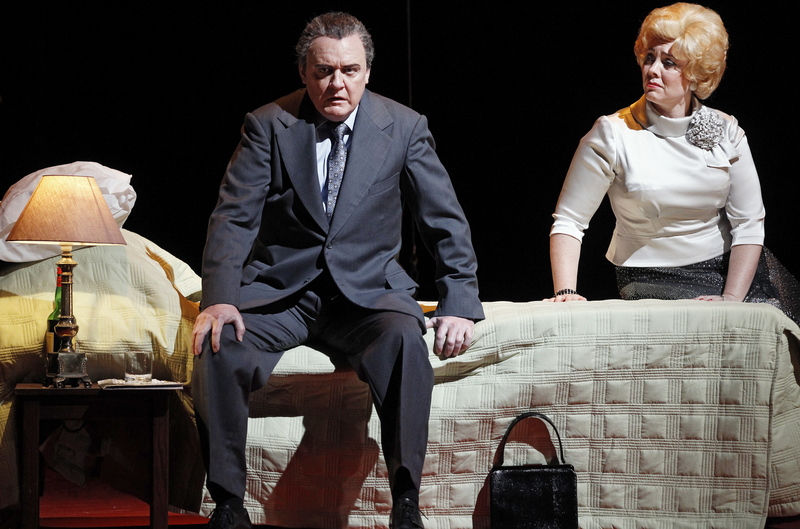 Director Dean Bryant, an associate director of Melbourne Theatre Company, delivers a beautifully realised, endlessly entertaining production. On paper, the play is splendidly cast; on stage, these talents manage to exceed expectations, and also coalesce in a wonderfully cohesive ensemble performance. Bryant’s greatest achievement here is unearthing the humanity of Wilde’s characters; the various society “types” are vividly portrayed as real people, and both the comedy and pathos are all the stronger for it. Where Broadway struggled last season with the sexist elementsin revivals of My Fair Lady and Carousel, Bryant simply respects audience intelligence, trusting that audiences will discern that the espoused views are those of the characters in situ, not of the company at large. Further enhancing the quality of the performances is the work of voice and dialect coach Leith McPherson. The upper class London accents are uniformly crisp and clipped, and are adopted with remarkable naturalism. Supporting Bryant’s focus on downstage action, designer Dale Ferguson hems in the space with angled, towering walls of gauzy curtains, using buttercup yellow for the optimistic home of the Chilterns and dark burgundy for the den of bachelor Lord Goring (Brent Hill). Against these relatively simple backdrops, Ferguson’s costumes are rich in detail. The play’s timing towards the end of the London season is reflected in sleeveless dresses in pale summery tones. Visiting from the continent, blackmailer Mrs Cheveley (Christie Whelan Browne) begins in a fitted black velvet gown with white floral applique before changing to an equally sleek gown with luxurious ruffled coat. Lady Markby (Gina Riley) sports peachy tones in decorative designs that hint at her comical status. Composer Mathew Frank has provided an overture in which Bryant establishes the action with a brisk series of tableaux, punctuated by the lighting of Matt Scott. Franks’ sound design maintains atmosphere throughout the evening. 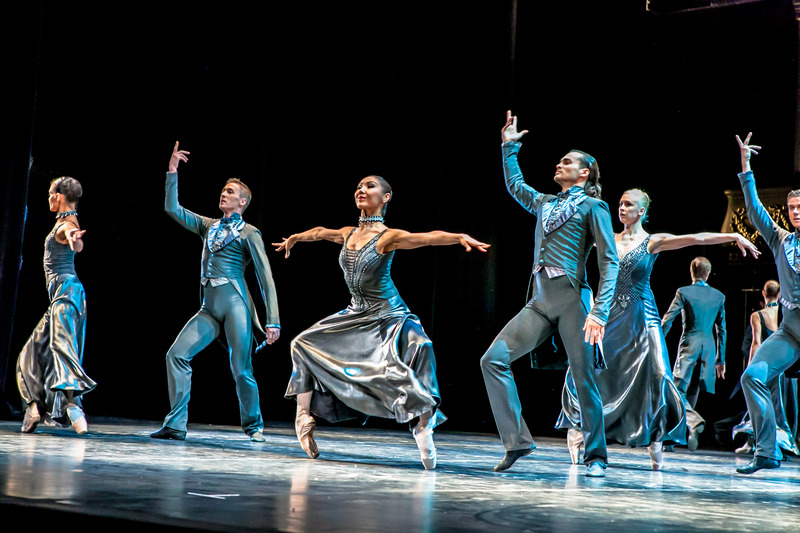 Scott focuses attention at the end of each of the four acts with a gentle dimming of the lights. Gleeson captures the swirling inner turmoil of a great man facing disgrace, neatly underplaying the emotions so as to maintain Chiltern’s very British stiff upper lip. Gleeson successfully keeps the audience on Chiltern’s side, ensuring the morality of the play exists in an interesting grey area rather than simple black and white. As well-fed, mutton-chopped dandy Lord Goring, Hill crafts a marvelous characterisation, engaging audience affection for a character that could be seen as a spoiled layabout. Rounding out his well-judged performance, Hill executes some nifty physical comedy. Whelan Browne makes a striking move into darker territory, chillingly playing a woman whose radiant beauty masks a sinister penchant for blackmail and theft. Whelan Browne colours the wily, self-serving woman with moments of vulnerability, greying audience reaction to a character who could simply be villainous. Whelan Browne and Hill generate all manner of sparks in the act three showdown between Mrs Cheveley and Lord Goring. As rosy-cheeked matron Lady Markby, Riley is in stellar form, her comic timing honed to perfection. As noble Lady Chiltern, Okenyo brings warmth and maturity, conveying the steely resolve required of a Victorian woman to survive her tenuous station. 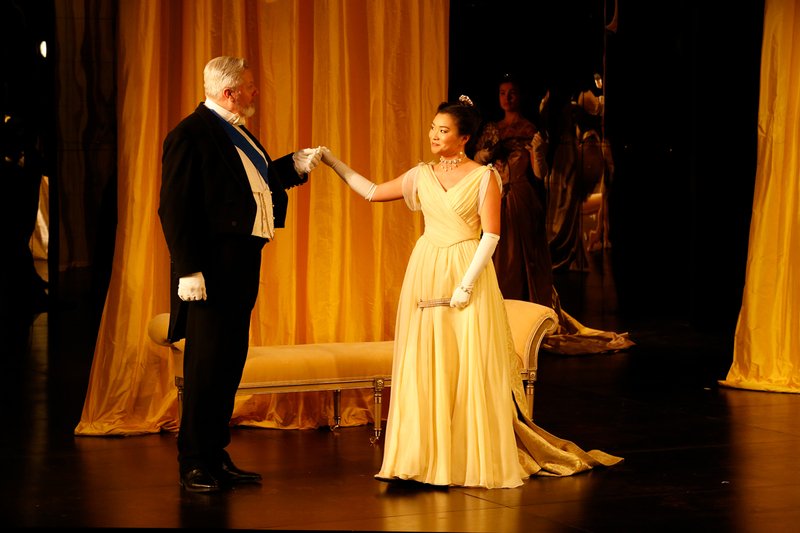 Michelle Lim Davidson adopts a delightfully kittenish tone as Miss Mabel Chiltern, a gleeful young woman who still finds a thrill in the practices of society. Playing the white whiskered, barrel chested Earl of Caversham (father of Lord Goring), William McInnes tempers his deliberately bombastic performance with just enough paternal concern to provide a touch of realism. Playing a number of supporting roles, Josh Price scores laughs as weary butler, Phipps. Greta Sherrif brings reliable elegance to the amusingly conceited Lady Basildon. 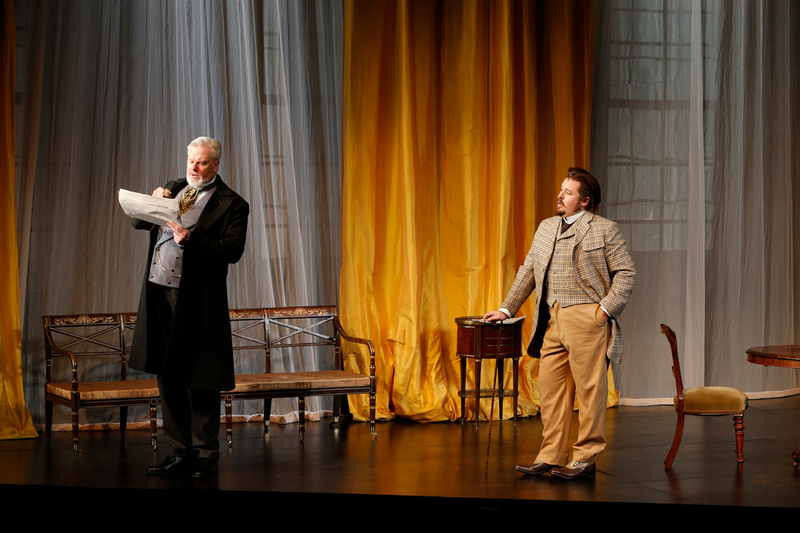 An Ideal Husband is sure to thaw Melbourne winter chill with its rosy warmth and abundant merriment. Attendance, for those lucky enough to acquire a ticket, is highly recommended. 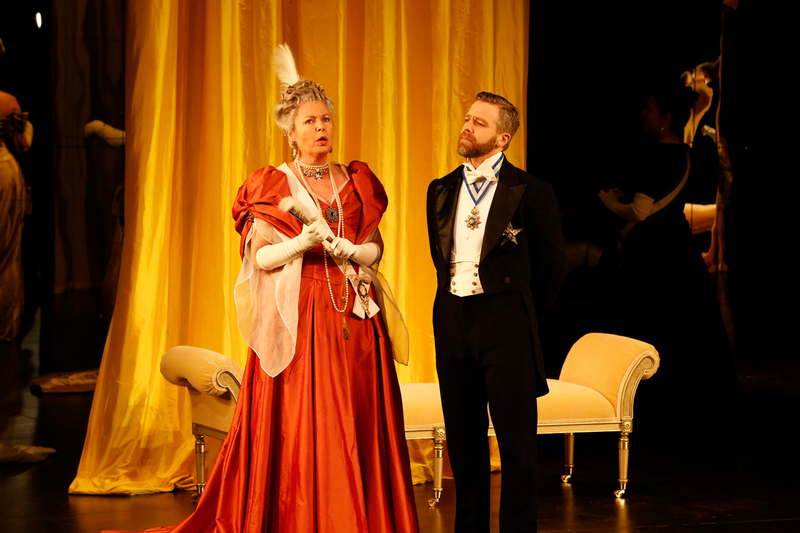 An Ideal Husband plays at Playhouse, Arts Centre Melbourne until 18 August 2018. The An Ideal Husband program can be read online.